Anyone remember when you were young, we mean real young, back when you’d sit and wonder about the computer games of the future and how great they would look. Yes, also the time when you should’ve known better than to open your original Star Wars toys from the packaging, since you didn’t know that if you had just kept them in the original packaging, you could now sell them and become incredibly rich. God dammit! Why didn’t we buy doubles of all those marvellously classic figurines? Instead we played with them until they were pretty much worn out, then stuck them in the attic for decades and later donated them to needy children in the Eastern block, who may just have missed out on the phenomenon altogether. C’est La vie. You’d be laughing all the way to the bank if you’d kept them all nicely wrapped, since people’s love of Star Wars hasn’t waned since 1977. As a matter of fact, it’s definitely escalated to even more epic proportions. Some people had some concerns when Lucas Films sold the Star Wars franchise to Disney back on October 30th of 2012, for $4.05 billion, which sounds like a lot, but in judging by the new Disney backed Star Wars films and how well they have been received by Star Wars fanatics, all is going brilliantly well, both authentically and economically. With two films already released and in the bag, making them now sit perfectly poised with just one film away from yet another trilogy. Result! But, what else does Disney also do so very well besides making movies? Why, amusement parks, of course! 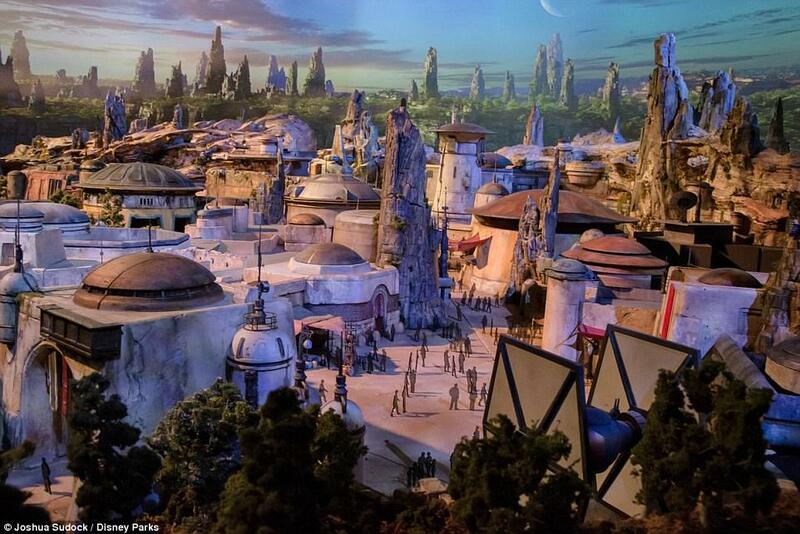 Come 2019, these new kids of the Star Wars generation are going to be getting ‘Star Wars Land’ to add on top of their already amazing experience at Disney World/Land. Yep, we sh*t you not, which means that you’ll have to go there as an adult now, just to make sure that you don’t miss out again. Firstly, you’ll also have to greedily push the Star Wars franchise onto your children (or force them, haw haw), if you haven’t already done so. Now, we know that you already have, so put this in your calendars, repeat after us, “SUMMER 2019“, because that’s when Star Wars Land is expected to open its gates. Where are we getting all of this information you might ask? From a truly amazing concept and epic model that was just released at the Anaheim D23 Expo in California just yesterday. Now it gets better, since there’s not only going to be one amusement park, there’s actually going to be two of them. One located in Disney Land Anaheim, CA. and one in Disney World Orlando, FL. Major Nerdgasm! 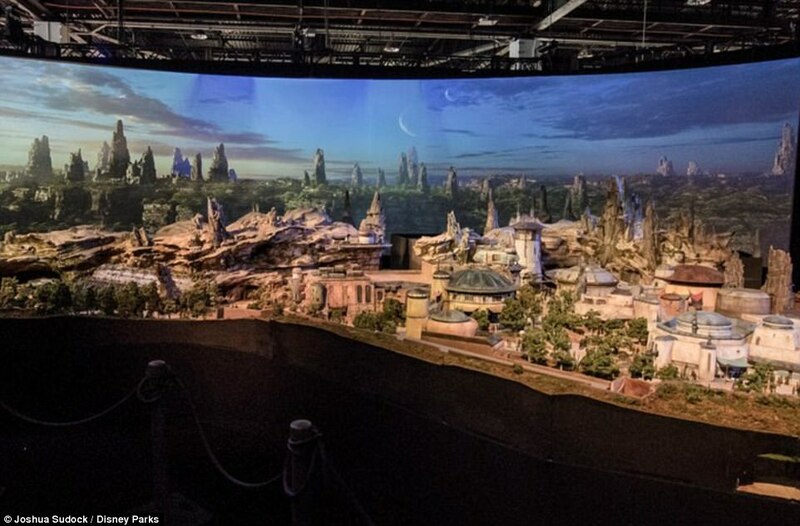 Disney Chairman Bob Chapek showed off the model at the D23 Expo and highlighted the intricate design elements featuring detailed buildings, miniature figurines and an intricate world of grasslands from the Star Wars series. Our one question straight away is, will there be enough space for Jar Jar Binks in the park or not? (the jury’s still very much out on that). 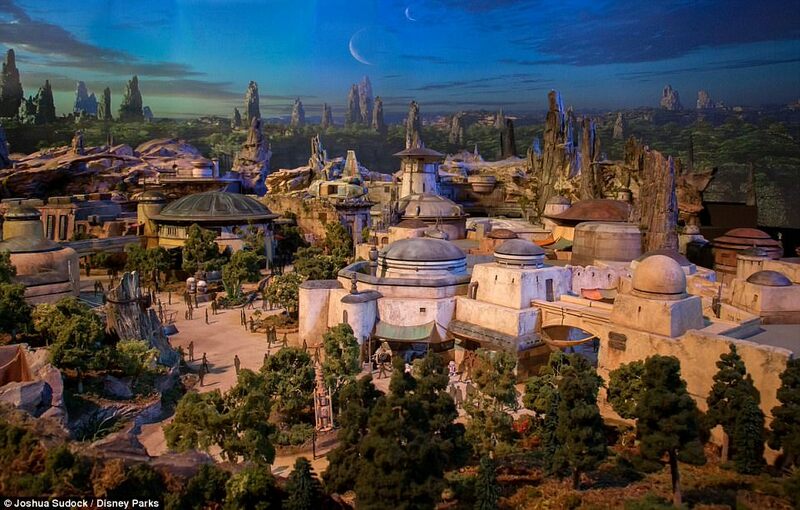 Bob Chapek stated the following regarding this little known revelation that hit the Star Wars world just yesterday, ‘To say we are excited for the Star Wars-themed lands to open in 2019 is an understatement”. Seriously, people are at a fever pitch for this news and we are glad to be able to relay how much it means to Jedi’s all across the planet, right now. It’s truly time to break out those Light Sabres and let’s just get it on people! Attendee’s to the park will be able to take control of the Millennium Falcon on a customisable secret mission, so that it never gets boring (as if! ), and also can experience the battle between First Order and the Resistance. Now if you still think this is all just rumours, let’s tell you that the project is already underway and will be splayed across 14 acres of land in Florida, which will make it the largest expansion to Disney World in history. Yes, ever! The park will be located somewhere on the outer rim, on the edge of the unknown regions, which sounds seriously effin’ mysterious to us indeed, and now we contemplate about moving to Star Wars Land and just end up living there in the unknown region for the rest of our lives, away from the craziness of the world. Another Tweeter, tweeted, “There might be a tear of happiness shed when we visit this beauty”. You damn right there will be, we can feel some tears coming on right now, actually. This is truly fulfilling the wildest dreams of adults and children, across the whole planet right now and so what’s not to like? We’re beyond excited and it truly looks like Orlando is the place to be from 2019 onwards, doesn’t it? Buy Star Wars Rogue One Here! Buy Star Wars The Force Awakens Here! Pre-Order Star Wars Battlefront on PS4 Direct to Your Door!